"Trop-Rock" is a new genre that includes musicof all styles that have lyric based songs about the tropics, island life, beach life and sailing and boating life and a whole lot more. 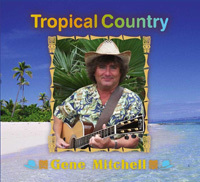 Gene Mitchell is back with his 12th CD of original music, this time combining at bit of country and country-rock with his well known jazzy style of tropical music. So, kick back, and let "Tropical Country" take you on a new adventure to the tropics, this time bringing along a bit of Nashville. Order your copy today HERE.